Most animals have evolved eyes that focus in air or in water. Some have evolved eyes to have an aerial or aquatic view at different times (see BJO cover July 2002), but few species indeed have evolved a design that can focus in both media simultaneously. Anableps anableps (from the Greek meaning “enlarged eye”) does just that. “Cuatro Ojos,” as the fish is known in Brazil, seems to be so odd as to be unbelievable. But these incredible fish, and their close relatives, have evolved the necessary adaptations to prosper as intertidal specialists, and can be found in fresh, brackish, or even pelagic waters. There are three different species of Anableps and while the ecology of the three differ somewhat, each has similar environmental needs for multiple eyes with similar ocular design. All three species grow to a maximum of 30–35 cm and resemble flat, floating cigars with large eyes with the long axis of the body of the fish parallel to the surface of the water. All of these fish can see simultaneously in air and water using a unique ocular design, as can be seen on the cover. The aerial cornea is steeper and the pupil larger than the aquatic counterpart. The iris displays a finger-like projection that divides the pupillary aperture into two halves and corresponds to the pigmented band on the cornea. The iris and corneal ridge create a separate pupillary aperture for both the aerial and the aquatic images. When dilated, the two separate pupils form a single, dumbbell-shaped aperture. ). The lens is oval in equatorial cross section, instead of round, and has the accommodative mechanisms of anterior-posterior movement along the visual axis of the pupil, as do other fish species. The inner nuclear layer of the retina in the ventral half of the globe, subserving the aerial field, is thicker and contains more bipolar cells compared to the dorsal half. 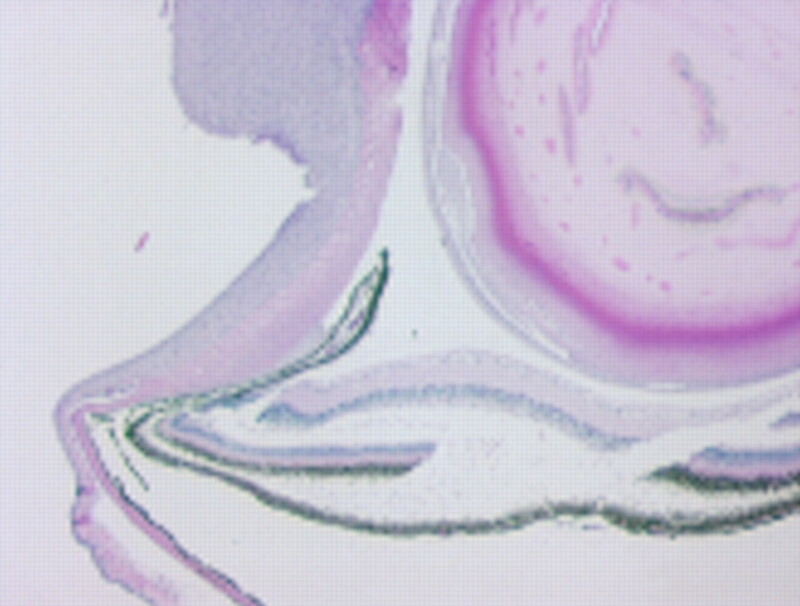 There are more ganglion cells in the ventral retina, with perhaps one half to two thirds as many in the dorsal half of the retina. The retinas are distinct in that there is a separation between the two halves that subserves the aquatic image compared to the inferiorly positioned retina that subserves the aerial image. There is a single optic nerve that receives projections from each separate retina. Evolutionarily speaking, the Anableps species are neither primitive nor particularly advanced. This small specialised family of toothcarps, Anablepidae, contains only three species, A anableps, (mainly brackish, eastern South America) A microlepis (north and northeast coast brackish and oceanic, eastern South America), and A dowi (Pacific coast, Central America). All three species, but especially A dowi, eat insects above and below the water line. A dowi is even an active nocturnal hunter pursuing prey on mud flats out of water. These fish feed above the water surface, at the water surface, and in the water column. They leap out of the water to attack aerial insects and use their aerial vision for this purpose. All three, but especially A anableps and A microlepis, feed on the tidal flats sifting through the mud with unusual teeth acting as a sieve. The aerial vision with the superior cornea and superior half of the lens provides for excellent acuity and can be used to locate prey, but is especially used to alert the species to predators. Birds and small aquatic predators are the danger, although most aquatic predators will not follow the species into the tidal flats. Since Anableps has no eyelids, it will frequently submerge the aerial eye to wet the surface, and, if on dry land, to wet its gills. All three species probably rely on their aerial vision for protection against predators as a primary function, and feeding tends to have a somewhat less important role. In the three Anableps species, we have an animal that occupies a specialised niche requiring excellent aerial vision for feeding and especially for protection against predators. These fish certainly illustrate that diplopia may have its advantages. 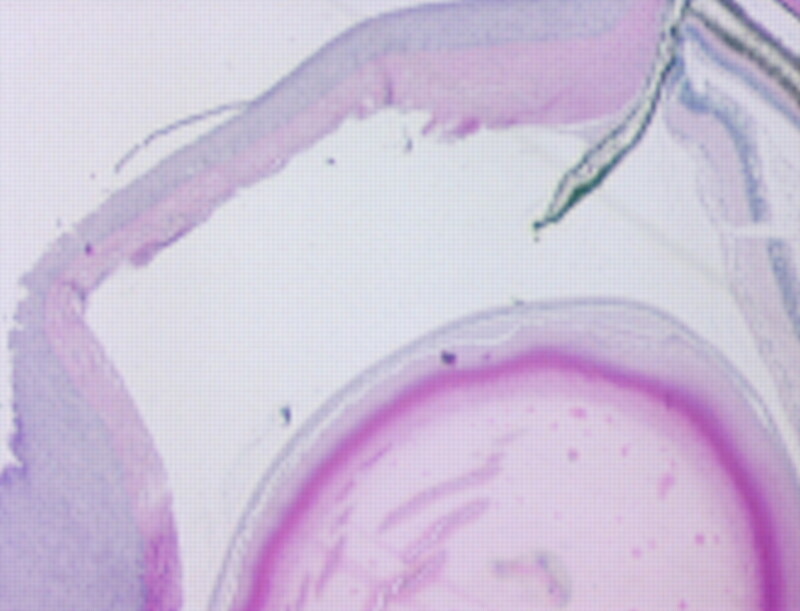 Histological section of aerial portion of globe. Histological section of aquatic portion of globe. Note shorter radius of curvature of aquatic portion of lens as discussed above.